These aren't your average wall stickers! 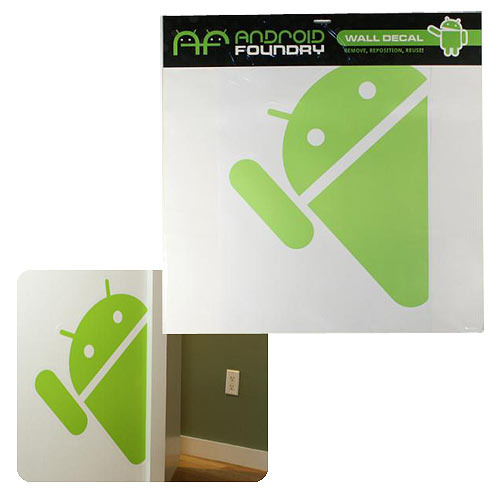 The Google Android Foundry Drop Down Android Giant Wall Decal shows the mascot peeking around a corner or out from a door. No matter where you put him, the Hidden Android is ready to greet you with a friendly wave. This single piece wall decal is easy to apply and sure to amuse. These high-quality oversized fabric textured wall decals can be removed, re-positioned, and re-used multiple times without damaging walls or surfaces. Brighten up your cube or home with a few big green bots! Measures 20-inches tall x 15-inches wide.